I’ve been listening to podcasts for as long as they’ve been around. Podcasting, or “audio blogging” has been around since the 80’s. Today there are more than 115,000 available, covering pretty much any topic you can think of. 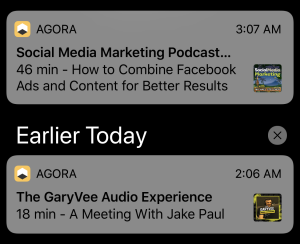 The length of a podcast can range from just a couple minutes to a couple hours. 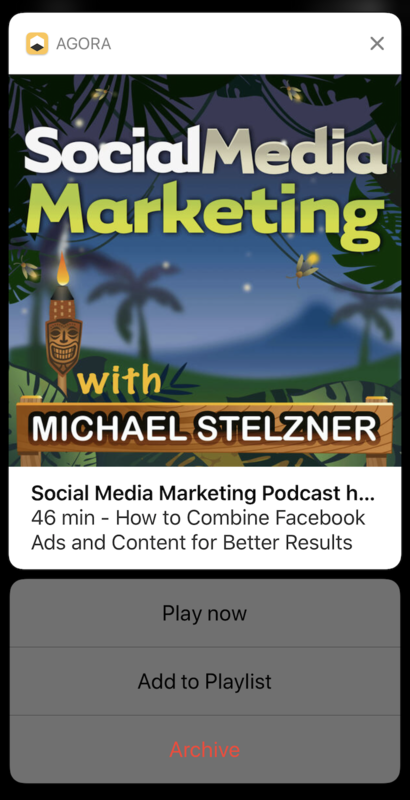 But what is the best way to listen to your favorite podcasts… on iOS, specifically? After much research, I’ve got a new favorite-and I’m obsessed with it. Note: This is not a sponsored post, and I paid for these apps. What’s Wrong With Apple’s Podcast App? I’ve been using the default Apple Podcasts app, but recently started listening to more podcasts. It fell short of meeting my requirements for what the ultimate podcast app should have (see below). As I started subscribing to more and more podcasts, I found them difficult to manage with Apple’s app, and decided it was time to cast off. The proliferation of podcast apps in the App Store are a direct result of Apple’s rather lousy in-house developed app. 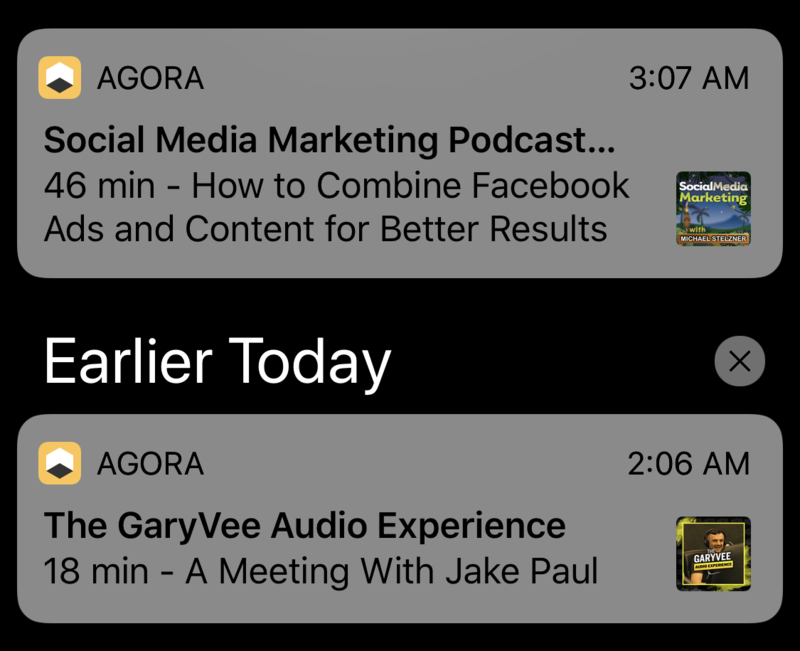 While most podcast apps support push notifications to alert you of new episodes, some just didn’t work at all. I also wanted “rich” notifications. By that I mean there are options when you 3D touch (or “force touch”) the notification. I didn’t just want to be notified via the notification, but I wanted to be able to act on it: listen to it right now, or archive it. The title alone tells me whether it’s something I want to listen to later or listen to immediately. A few supported dark mode (which I love on the OLED display of the iPhone X). Most were not minimalistic, meaning they had a very cluttered user interface with way too much going on. Very few were easy to use. I don’t mind paying for apps, and there are some apps where paying monthly or annual fees makes sense. 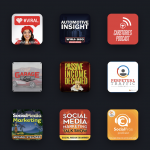 A podcast app with a SaaS (Software As A Service) business model doesn’t make any sense, and while there was one I encountered ($1 per month for all features), I steered away from those. When I’m looking for a new favorite app, I typically don’t just download the first two that I see and decide between them. I tend to go crazy and download as many as I can find. Why? Because I don’t always trust the App Store’s reviews. 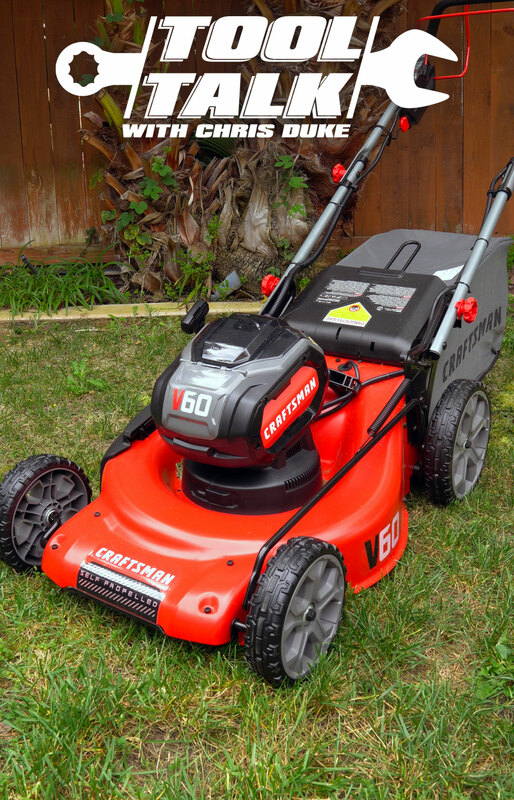 Just because an app has over 2,000 four star reviews, doesn’t mean it’s the best. New apps are being published every single day. 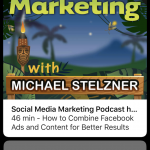 No app developer is going to publish a new podcast app if they themselves haven’t done the research to make something better, or different, from everything else that exists. 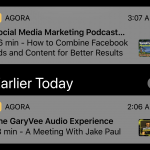 I tested all of these in early April 2018, and decided I liked CastBox the most, but that was mainly due to its wicked fast push notifications for new episodes. But its UI was a bit cluttered, and full features cost $.99/mo (and I just hate monthly subscriptions). What’s more, is I found out that they are an Android-first development company. So new features hit Android first, then some point later the iOS app gets the new features. Moving on! I searched a bit more and finally found one more that I hadn’t discovered before called “Agora“. What a strange name for a podcasting app. 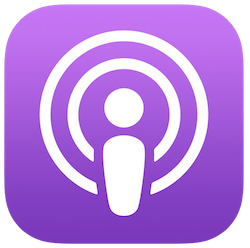 What’s more, is its simplistic icon also didn’t make me think of a podcast either. It was easy to skip during a search. Just like the others, I downloaded it expecting to be underwhelmed in multiple ways. The reviews were positive (4.3 out of 5 stars), but it also came at the price of a one-time $1.99 app purchase. I decided I’d go for it and if I hated it, I’d ask for a refund. So I went for it… but this time, I wasn’t disappointed. As you can see from my screenshots in the gallery below, it has a very minimalist user interface, but it has all the features I liked in the other apps including dark mode, a sleep timer, speed control, subscription backup, archive feature, rich notifications, 3D touch, and more. It has an absolutely beautiful interface, and of course you can switch between dark and light modes, or set to to be automatic depending on time of day. And finally, show notes are so important. I want to be able to read them without squinting. The font can’t be too small, and the links in the notes for an episode must be active. I want to click the links to go to the website or Instagram or whatever is there for more information while the podcast is playing. 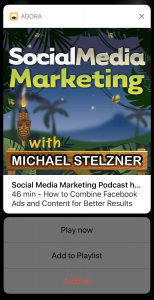 Being able to look at pages or social media accounts while I’m listening to the podcast creates the full immersive experience of listening to a podcast that I want. 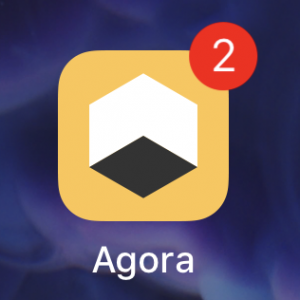 My only complaint about Agora is that the icons can take a few tries to get used to what they do. They are unfamiliar, if not futuristic looking icons. So while navigation at first might be a bit confusing, there aren’t that many and you’ll pick up on it quickly. And don’t be afraid to use typical gestures that you would use in other apps, such as swiping from the left side of the screen to go back. 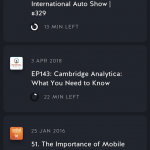 While my requirements were my own, and my preferences are unique to me, this doesn’t necessarily mean that this is the perfect podcast app for you. You might download it and absolutely hate it. You might find it confusing. My only advice is to just give it a shot if that’s the case. Go to the Settings (bottom right icon) and tap “How Agora works?”. You’ll find a wealth of tips and information there on how to use the app. What I love most about it is that the interface isn’t cluttered with a ton of icons to do things. Instead, there are simple gestures like a tap or a swipe to make things happen. One example of a simple gesture is to swipe left or right on the bottom (where the play/pause button is) to skip forward or backward :30 seconds. Swipe again and it will skip even more. I reached out to their support email address and requested that it start at :15 seconds, not :30. I got a response within hours, indicating that their next update would include that shorter starting time. Nice, friendly, responsive support. This is just such a beautiful app to use, or to leave open at my desk while I’m working and listening to podcasts in the background. Sometimes it takes a lot of research and trying different apps in order to find the right one for you. I’m so happy with Agora, and this is my way of thanking the developer (Javi Perez) and spreading the word about it. If you’re looking to step up your podcast listening game, or are just starting out–start here. What’s your favorite, and why? Leave it in the comments section, below. 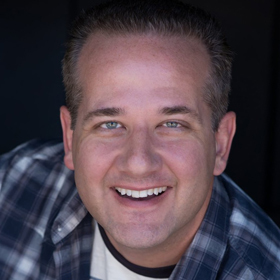 – Proximity sensor: Bring the cell phone to your ear and the episode will play. – Timer: Select the time you want the playback to stop. 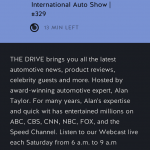 – Podcast speed control: Increases the audio tempo and saves time to listen to more episodes. – Save subscriptions backup to iCloud automatically. – Manage your activity like a TODO app. – Custom themes (day, night and dynamic). 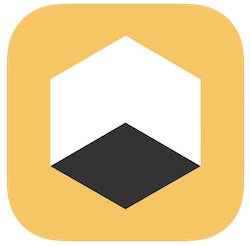 – Simple gesture-based design to explore the app. – Quick access with 3D Touch. 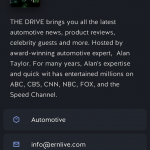 No Replies to "The Best Podcast App For iOS"
This is the official website for Chris Duke: Car Guy, TV Host & Producer.